September 23, 2002, LG Crabo. 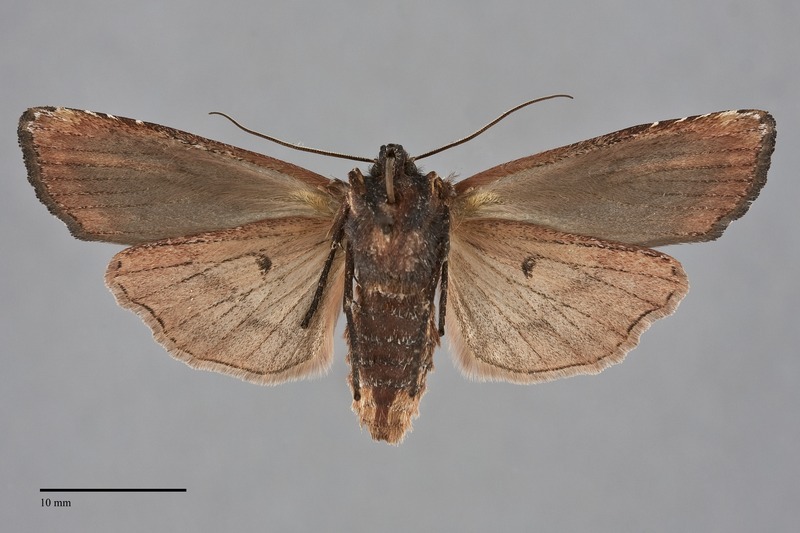 Xylena cineritia is a large streaky moth (FW length 22–24 mm) with dark gray forewings with a brown costa and ochre yellow streak distal to the large double orbicular and reniform spots that flies in dry forests and forest-steppe ecotone during late fall and early spring. The forewing is relatively long with a slightly pointed apex. The ground color is dark gray, slightly brownish along the posterior margin. The costa is warm purplish brown. An ochre streak with a small amount of proximal red color extends from inside the reniform spot to the medial terminal area. The anterior wing base is whitish gray, fading in the antemedial area. A small diffuse brown basal dash is present. A long black spike or wedge in the subterminal area is located above vein M3 at the posterior edge of the ochre streak. Small black spots are present near the bases of the radial and cubital veins. The antemedial line is double, gray, strongly looped laterally in the cell and widely zigzagged on the posterior wing but faint. 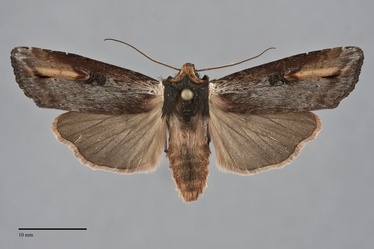 A diffuse wavy median line is evident on the posterior wing in some specimens. The postmedial line is reduced to small dots on the veins. The subterminal line is light gray, yellow at the end of the streak, diffuse and waved, offset below the apex and nearly parallel to the the margin elsewhere. It is preceded by the black spike that is described above and a gray diffuse shade. The fringe is dark brown-gray. The orbicular spot is oval or very weakly hourglass-shaped, completely outlined in black, double, filled with the gray ground, positioned close to the reniform spot. The reniform spot is moderately large, boomerang-shaped, outlined in double black medially, is open anteriorly and posteriorly, and more diffuse gray and red laterally, filled with ochre. No claviform spot is evident. The hindwing is medium-dark gray with a pink tint in fresh specimens. A thin dark terminal line is present at the base of the off-white to pink fringe. The top of the head and most of the collar are striped brown and tan. The face and edge of the collar are blackish gray. The rest of the thorax is brown-black with pale gray on the anterior tegulae at the wing bases. The male antenna is biserrate. This species can be recognized by its dark gray and warm brown and yellow streaked forewing with closely positioned orbicular and reniform spots. It is similar to Xylena thoracica, a slightly less common moth in our area. The forewing is darker gray and less streaky in X. cineritia, its brown and yellow colors are warmer and richer than in X. thoracica, and its thorax is darker black. This species is common and widely distributed across North America in moist forest and riparian habitats. In the Pacific Northwest, it is common at higher elevations in mixed hardwood-conifer forests of the Cascades and Rocky Mountain regions, as well as along creeks and rivers at middle to low elevations east of the Cascades. It is less common west of the Cascades, but occurs in moist riparian hardwood forests in this region. Xylena cineritia is found predominantly east of the Cascade and Coast Ranges, with the range extending north to central British Columbia. It is collected most commonly in the foothill regions surrounding the dry interior steppes such as the Columbia Basin and at higher elevations in the Cascades and Rocky Mountain regions. The distribution west of the Cascades is spottier: the northern Cascade Range and Vancouver Island in southwestern British Columbia, the south Puget Sound region in Washington, and the southern Willamette Valley and the Siskiyou Mountains in Oregon. Xylena cineritia has only been found in the Panhandle and near the border with Washington in Idaho. This species ranges across the Continent but is most widely distributed in the West. It is found in the northern half of California near the West Coast, and from central Alberta to Colorado in the Rocky Mountain region. The range extends east through southern Canada and the adjacent northern United States to Nova Scotia and New Jersey. This species is a generalist feeding on many kinds of hardwoods, but shows a preference for Betulaceae, Salicaceae, Ericaceae, and Rosaceae. Xylena cineritia and other members of the genus eclose in the fall and overwinter as adults, flying again in the spring. It has been collected from August to November in the fall and from late February to early June in the spring.